JAMES Tedesco has taken over Billy Slater's crown as the NRL's best fullback. And just like Slater always found a way to continually take his game to the next level through hard work on the training paddock and relentless home work off it, now Tedesco has set himself the challenge to become even better in 2019. 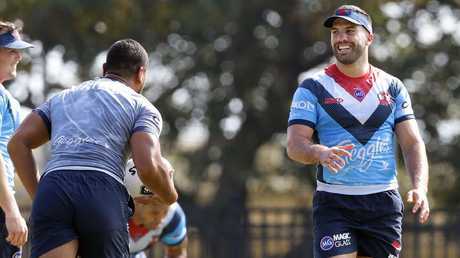 Ahead of Friday night's round one blockbuster against arch rivals South Sydney at the SCG, the Sydney Roosters' flying machine opened up about how Trent Robinson identified areas in the 26-year-old's game that he needed to focus on throughout pre-season. "I still feel like I have a bit to improve on," Tedesco said. "Even Robbo sort of said, 'James Tedesco was good last year but he can get even better this year'. "I fully believe that. I have been working really hard on passing. "Robbo has said my decisions are really good, it is just that consistency with accuracy, which is what I want to be even better at. "Defensively I believe I was really good in terms of organising (in 2018). I am happy with where I am at there. "Defensively I was probably at 99/100 per cent in terms of helping out the team. But attack-wise I think I can still improve." It's a scary thought for opposition teams, especially when you take into account just how much Tedesco's game evolved in his first year at the Roosters. Fox Sports Stats show that between 2016 and 2018, Tedesco has more than doubled his personal tally of linebreak and try assists that put him ahead of both Slater and Tom Trbojevic last year, while he is also having more runs and making way more metres on average, with more tackle busts. 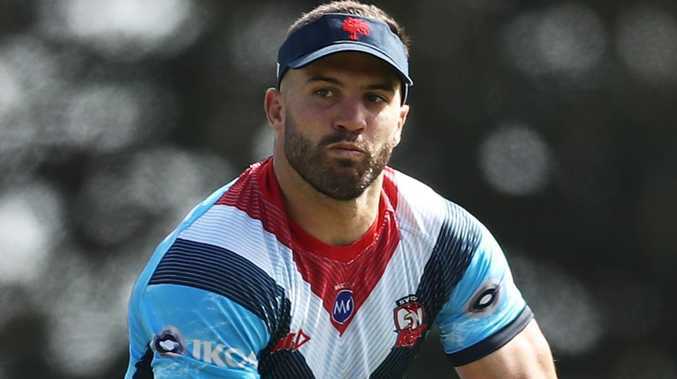 Tedesco admits the pressure that came with arriving from Wests Tigers as one of the Roosters' star signings along with Cooper Cronk weighed him down initially. "I probably put a bit of pressure on myself," Tedesco said. "Obviously being a big signing at a big club, I wanted to impress. But this year I haven't put that pressure on myself. "I am obviously a bit more comfortable having last year under the belt and being able to build those combinations." While there was plenty of early criticism last year about the Roosters' lack of cohesion in attack, they still finished the regular season as minor premiers after building their foundations on the back of being the NRL's best defensive unit. But attack is where Robinson now wants to see the Roosters take their football to the next level. Tedesco said the players were trying to ignore the hype surrounding the chase for back-to-back titles, but there is no escaping reality. "Every team is going to lift against us because they know we obviously won it last year," he said. "The hunger of wanting to win again probably isn't there at the moment where it was last year. But I think if we just take it week to week and play good footy. "The hunger will start to grow even more by the time we get to the end of the year. "Last year a lot of teams that started really well sort of fell away by the end of the year. So I think Robbo has the experience. "He will know how to build us up and get us ready for the right end of the year." Breaking The attack happened on Eurong Rd on Good Friday.